Michelle Nauman-Brown, our youth advocate, continues to build on the momentum created by the recent premiere of the "Michelle's Story" video. Her guest column appeared in the June 17 print edition of the Philadelphia Inquirer newspaper and is available on its companion website. "When I speak to foster youths in Pennsylvania, I always relate this true story about a girl who entered foster care at age 2," Michelle began. "Removed from her home, she was separated from her two half-siblings — the only family she really knew. "This girl lived in 28 foster homes, six group homes, even a six-month boot camp before signing herself out of foster care at age 18. She endured her mother’s death in a workplace accident, a failed adoption, unending loss. "I know this story intimately, not because I’ve told it so many times (although I have), but because it is my story." She travels the state "sharing my story with older foster youths in the hope that they learn from my mistakes" and encouraging them to get involved in their own permanency planning. "I want them to understand that establishing a caring, lasting, family-oriented relationship with an adult will help them succeed." 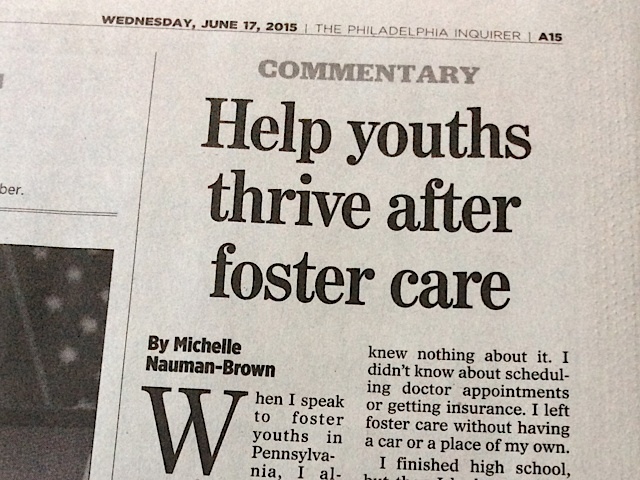 She noted that each year, more than 1,000 Pennsylvania youths exit the foster care system without a form of permanency. "These kids have had it tough," she wrote, "yet all they want is to be loved."